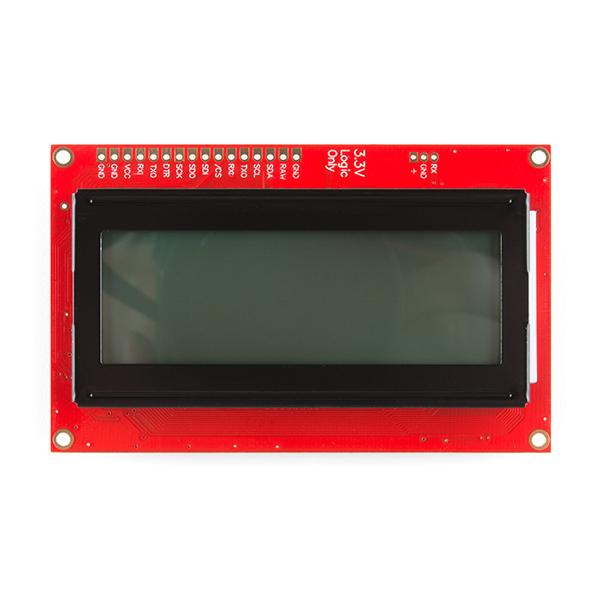 Do you have a 20x4 RGB on Black LCD or are planning to release one? Also, how do you change the text mode from ROM Code: A00 to ROM Code: A02? I think this should be the one by default. Whenever I change the brightness of any of the rgb fields I get the text "brightness 0%". Is there a way to easily disable this text on the lcd? Or do I have to reprogram it? Is there an electric schematic document for this board? I'm wondering if there's any spare pins that can be used to read button that would added next to the screen to make an interactive menu system... Thanks! Also, while it doesn't break out extra pins it does break out the UART, SPI, and I2C pins. Once you pick your protocol the other 2 are free pins to use for the most part. Since the code is open source you should be able to modify it to use those pins for whatever you want. Hey Jeffery, Thanks for reaching out. Unfortunately, we do not have a schematic for this design. But I can tell you that the pins broken out on the long header along the side are the same I/O pins that you would find on a standard Arduino. For example, RX/TX = D0/D1, SDA/SCL = A4/A5, and the SPI pins are standard (D10, D11, D12, D13). If you're looking for a good control interface, maybe the qwiic joystick and an adapter might be a good way to go - and you could use the I2C interface to communicate. Hope this helps! 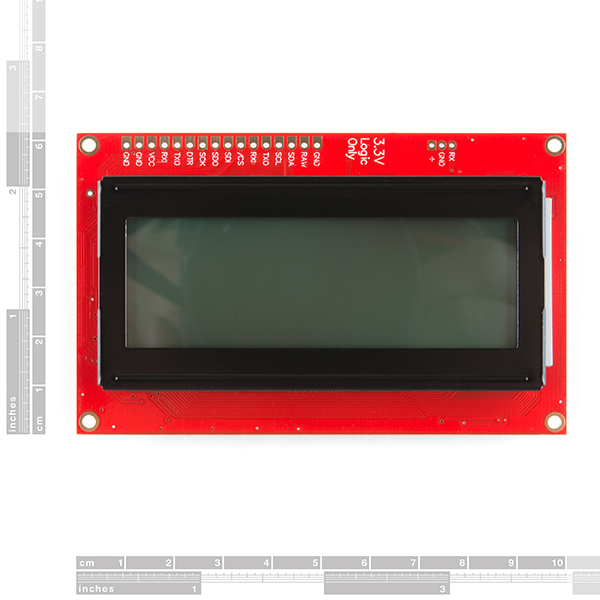 Oh, so if there isn't any plans, doesn't that mean this product (plus #14072 and #14073) are not OSHW compliant? That's too bad... The joystick might work as an alternative... I'll have to take a closer look. 3.3V (clearly marked!) means that it won't be a great add-on for the majority of Arduino projects; the user would have to inconveniently add level shifters. 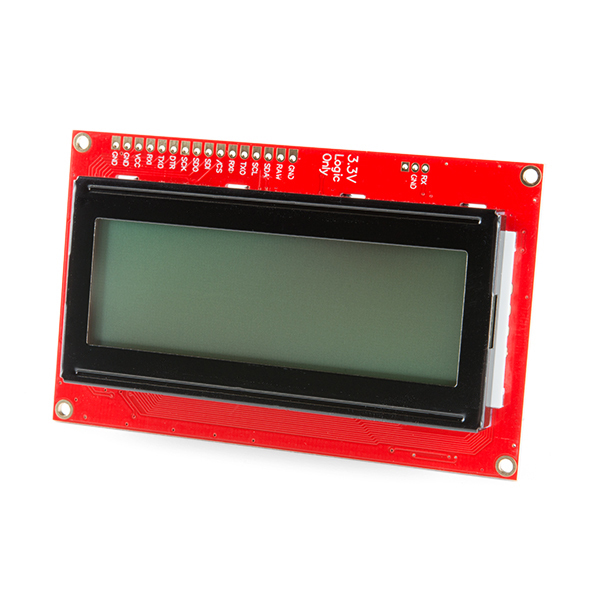 But it's a great fit for a Raspberry Pi, or for the newer ARM-based Arduino boards that run at 3.3V. Indeed, 5V tolerant screens would be sweet. That did come up a little late in prototyping (after the 2nd or 3rd round). Unfortunately, there just wasn't enough space on the back of these screens to add logic level conversion. Maybe we could pursue smaller package sizes for everything, but that would be a beast of a revision. Good point about the raspi, and we are lucky that there are a fair amount of 3.3V controllers these days. Thanks for your comment! Love the "3.3V Logic Only" Label - it will help keep the magic smoke inside! Nice, clear looking display too! Haha. Thanks for RTFM. Ya know, you can only make a warning so large, bold or highlighted, but ultimately, your reader has to want to read it :) I'm sure it will be overlooked by some, but I hope that they don't break too much. It will survive for a little bit before the I/O are unhappy. I, confess... I actually damaged a prototype by talking to it from a 5V test jig (I was so excited about the protos, I didn't double-check my settings, durp). So it happens to the best of us. 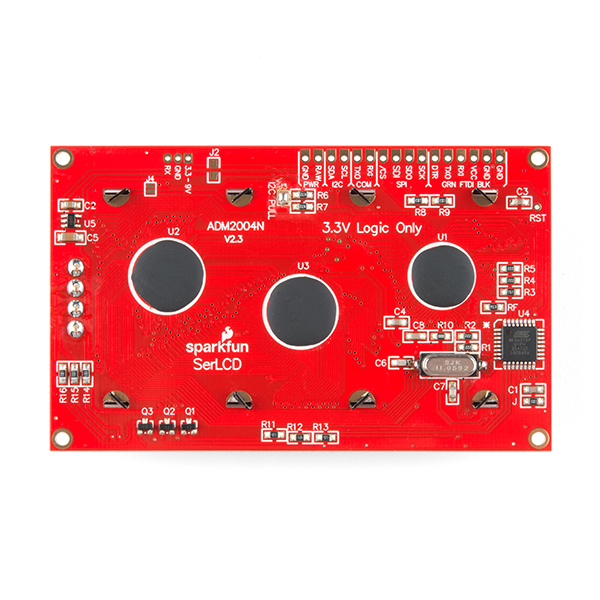 In fact, that's how SparkFun was started. Nate burned up his olimex programmer back in 2004 - having fun with sparks. I was looking for a display to go with some Qwiic components and this fit the bill perfectly. I soldered a Qwiic adapter on the I2c pins and it was good to go. Good looking display to be used for a readout on my MPD music player. Straight serial for ease of interfacing (3 wires) to a Raspberry Pi (did not want to use I2c because it is also being used to control volume to the DAC chip). 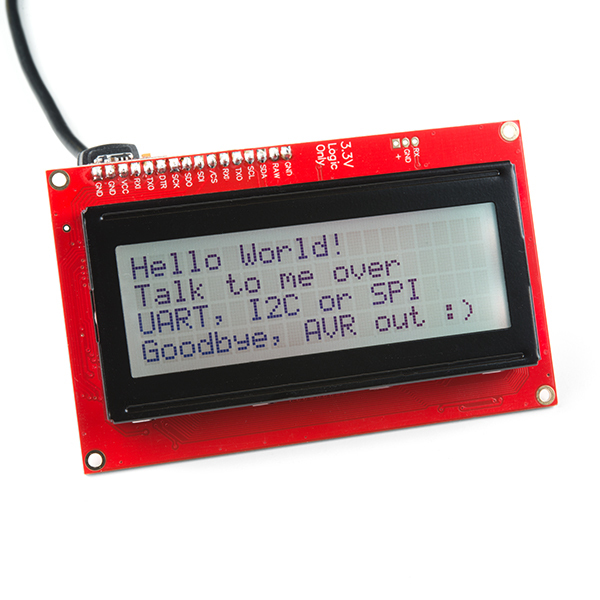 I would encourage SparkFun to please ship these units with the latest firmware. It took me a while to realize that was why the '+ RGB' command was not functioning. Then I had to cobble together a serial programming interface to update it. All is fine now and working. Time to plunge into Python programming land, one more thing I know nothing about.